Deliver this petite bouquet of 12 Pink Carnations online, freshly picked & wrapped in a tissue by our expert florist to pamper your dearest ones on special occasions. Deliver this petite bouquet of 20 Pink Carnations online, freshly picked & wrapped in a tissue by our expert florist to pamper your dearest ones on special occasions. 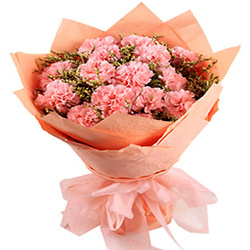 Deliver this petite bouquet of 30 Pink Carnations online, freshly picked & wrapped in a tissue by our expert florist to pamper your dearest ones on special occasions.